This is one of the original brand-name folders created for the site, and for almost three years it has been empty, just someone's distant memory - suddenly we have a nice pic and the circuit of the preamp. Thanks Richard. Abbey Boogie amp - early 1980s. Last design of a series of amps manufactured by Ross Nichol in Christchurch New Zealand before he emigrated to Oz. 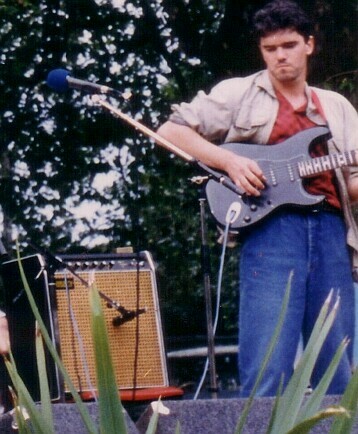 I've only a pre amp cct I traced from my unit in photo (forgive the haircut but it was 1985) Power amp was pretty much Fender twin: 100/50 W, 4x6l6GC, presence, slave out, 4,8,16ohm, Wicker trim. They were a well regarded amp, manufactured in combo (112 - mine had a JBL E120 - hey - that was the fashion then) and head units. Preamp circuit tracing by Richard. as well as the Abbey Boogie, there is an Abbey Harmonic. This is a Vox AC30 clone. These amps are distinguished by their galvanised-tin chassis. Abbey Sound began in 1975 in New Zealand, created by the ambition of one man ~ to build the best guitar amplifier in the world! Ross Nicol, a former professional musician with a background in electrical and electronic engineering, is the driving force behind the company. Having initially set up a workshop in a spare bedroom, then later expanding into his garage at home, Ross worked virtually day and night (in between gigs) - surfacing only occasionally for meals with his family - designing and building the first Abbey amplifier, based on the Beatles famous Vox AC-30. 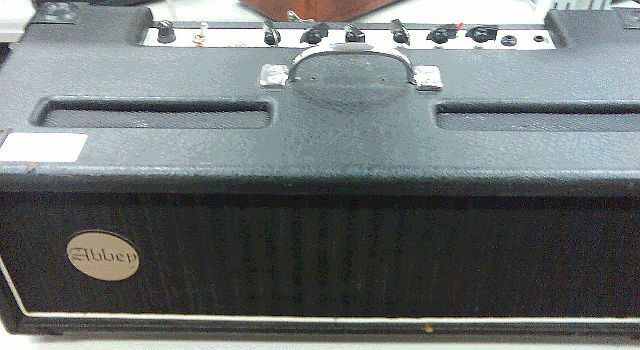 Encouraged by steady demand for the diversifying product range of Abbey amplifiers and speakers throughout New Zealand, the decision was made to relocate to Australia in 1980. Setting up in a small factory in the Melbourne bayside suburb of Seaford, Ross began with a small team to further develop the product range. For many years the company operated two complexes of rehearsal rooms in Victoria, located at Seaford and Port Melbourne, with several well-known Australian performers occasionally availing themselves of the facilities. During this period all manufacturing was carried out at the premises in Port Melbourne, till being relocated back to a new larger factory at Seaford in the late 1990's. The Abbey 100 is based on the Vox AC50, with the familiar “Normal” & “Brilliant” channels, but output has been upsized to 100 watts using 4 EL34's! On the back of mine is a little plate that says “Christchurch, NZ ”indicating that it's a pre 80's build as Ross relocated to Melbourne, Australia in the early 80's. Serial number is 045, so I guess at least 50 of these were made around that time? I've never seen another one like it, so I'm not sure how many would be out there. 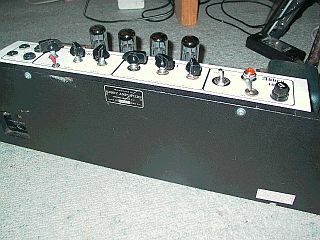 I bought this amp from Cash Converters in Parkdale for $300 in June 2008. I bargained them down from their asking price of $500 as I thought the amp was only half functional, with half the controls not functioning correctly. When I came home and inspected it further I realised, with a bit more tweaking, that it's actually essentially a fully functional amp and has simply been customised so that the controls are not doing what's indicated on the panel anymore, but have other functions. This conversion has basically involved turning a clean voiced AC-50 clone into a hot-rodded monster with a couple of knobs to control the two gain stages, and addition of a master volume control at the end. So, whilst the original controls would have been; (BRILLIANT) Volume, Treble, Bass, & (NORMAL) Volume, Treble, Bass, now the knobs function as Gain 1, Gain 2, Bass, Middle, Treble, and Master Volume. Gain 1 and Gain 2 controls basically add the same amount of gain when used individually, but have a cumulative effect when used together, facilitating quite high gain settings at low volume - way too much gain for my usual style of playing - but the clean tone of this amp is also still great, and a nice level of overdrive can be dialed in at whatever volume with a little tweaking and balancing between the gain controls and the master volume. 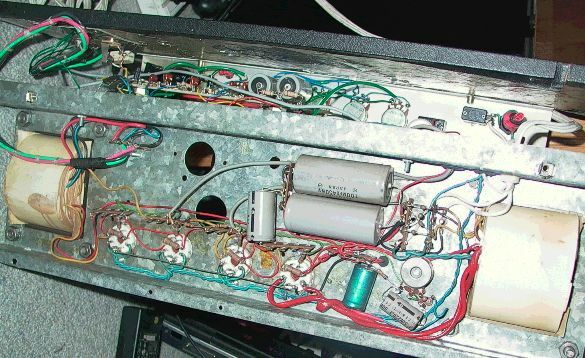 Another interesting point is that there are only 3 pre-amp tubes (which seems to be what your average AC-50 has) but the chasis looks like at some point it accommodated 5 pre-amp tubes. Don't know what's the story there. 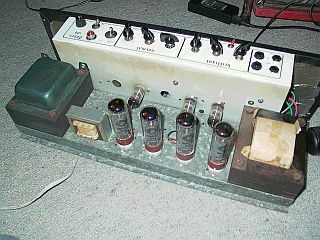 I'd be interested if anyone knows the pre-history of this amp. How it ended up in Cash Converters for $500 I don't know. That would normally indicate that someone's sold it to them for $200 or so. Crazy. This is a fantastic amp with hand made quality and components throughout by the looks of it. I'm not sure what the transformers are but they're big and heavy. The amp has four input sockets: two normal and two brilliant. On mine only one input is connected though. There's also a little switch been added alongside the Brilliant channel controls. This doesn't seem to have any function presently. I've been using this as one of my main amps for gigging and recording for the past few months and loving it. Amazing that it's possible to pick something like this up for $300 whilst a hand built or custom shop amp of this calibre would set me back a few thousand dollars! See power supply and quad output underchassis detail.